11/09/13 – CYBERTRON: \\\”Robots vs Aliens\\\” w/MODULATE playing live! 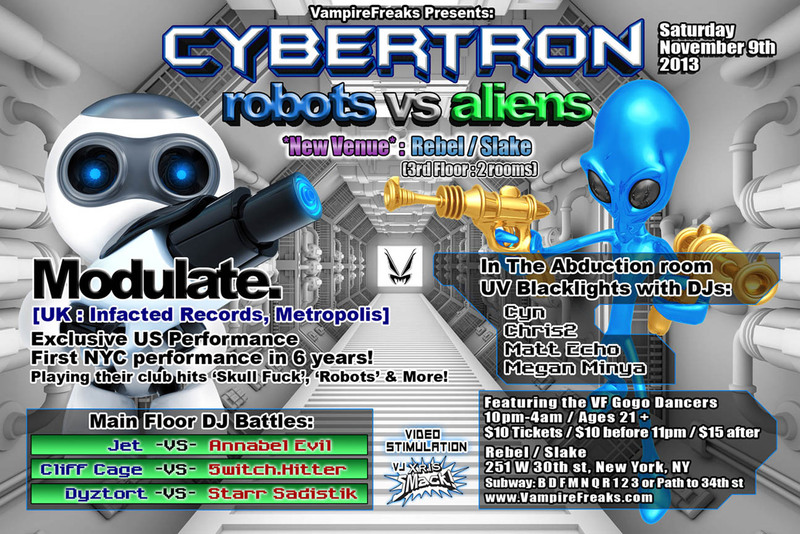 CYBERTRON: "Robots vs Aliens" w/MODULATE playing live! VJ Xris SMack! @ CYBERTRON "Robots vs Aliens" w/MODULATE live! First NYC Performance in 6 years! Playing their smash club hits 'Skullfuck', 'Robots' & More! New album coming out soon! Cliff Cage << VS >> 5witch.Hitter. Featuring the VF Go Go Dancers! Robots, Aliens, Cyber / UV Reactive, Metallic, Light up, Sci Fi! :Aliens, Cybertron, DJ Annabel Evil, DJ Chris #2, DJ Cliff Cage, DJ Dyztort, DJ Jet, DJ Star Sadistik, EBM, Industrial, Modulate, Robots, Vampire Freaks, Xris SMack!